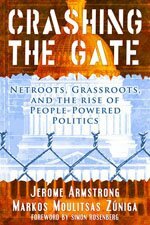 I don't get to read much these days, let alone write book reviews, but "Crashing the Gate" is a truly amazing book. If you're reading this blog, then you're probably already plugged into the Daily Kos and MyDD.com "liberal blogosphere." But even if you're not, this book is a great, quick read about the state of the Democratic Party, and how everyday Democratic activists who care need to take it back if we want to save the party, save the country and save ourselves. I tried reading it with a critical eye because I'm already such a part of the liberal blogosphere that I didn't want it to come off as a narcissistic puff piece. Incidentally, Beyond Chron was partially inspired by blogs such as Daily Kos. The SF Chronicle certainly isn't doing a good job monitoring the excesses of Gavin Newsom and Arnold Schwarzenegger, and somebody has to be out there speaking up for progressives in the media.